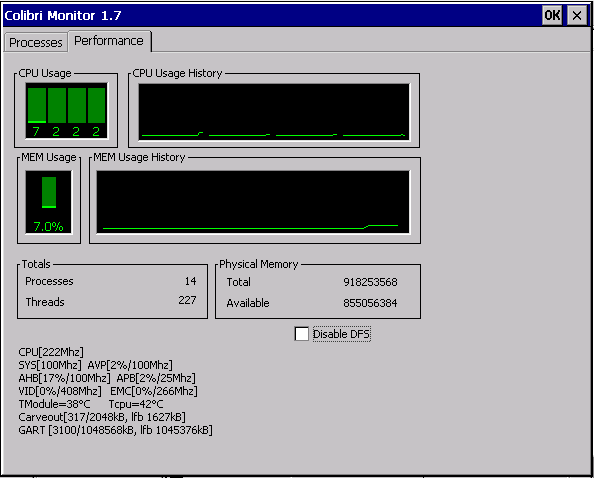 Colibri Monitor is windows-like task manger which shows the CPU related parameters (CPU usage, Process ID, Thread ID, etc.). Monitoring up to 128 processes on WinCE6, WEC7 and WEC2013. Support for Windows Embedded Compact 2013. Bug fix: Thread Priority for single core processors was not working. Bug fix: CPU processing was going more than 100% randomly.